Five years ago I wrote about conquering my culinary nemesis, Popcorn. After trying all the helpful hints readers had given me a couple years before in their comments on my initial post, Popcorn - My Culinary Nemesis, I put together a method that works perfectly for me every time. I’m still using the same pan, a lightweight but heavy-bottomed stainless steel pan, the perfect stovetop popcorn pan, one I can actually lift and shake several times during the popping rather than just scraping it back and forth on the stove. Other lessons learned are in the directions below. Step 2 (below) is the single most important tip that turned me into a popcorn master! Those 30 seconds off the heat after adding the popcorn kernels to the pan, hot from popping the 4 test kernels, make all the difference. I have few to no unpopped kernels, ever! At first I was using organic cold-pressed canola oil as a better alternative to the usual highly refined oils, but I wasn’t really happy about it. So a few years later, when I realized that extra virgin olive oil has quite a decent smoke point (375F/191C), I tried that and it worked beautifully. But that was a couple years ago, and I got to thinking about how clarified butter has a really high smoke point (485F/252C) and offers the added benefit of killing two birds with one stone, cooking the popcorn and buttering it at the same time. This photo is Popcorn; the other two photos are Caramel Corn. Clarified butter takes about 15 minutes to make and keeps in the refrigerator for several months. To make 2/3 to 3/4 cup, melt 2 sticks (8 ounces/227 grams) unsalted butter in a 1-quart saucepan, bring to a boil, cook over medium heat for maybe 10 minutes (long enough to cook off the water content), skimming off the foam floating on the top. Let stand for a few minutes, give it a final skim, and pour carefully into a half-pint jar, leaving behind any milk solids on the bottom of the pan. The foam and milk solids have a lot of flavor, so you can stir them into something you’re making or put them on your vegetables rather than putting them in the trash. Do leave a comment and share your likes and dislikes and tips for popcorn and its variations. I should tell you, my caramel corn is much less sweet than most, and I hope you'll try it this less-sweet way. Also, for those who care about such things, it contains no corn syrup. Please Pin it and share it! 1 Put 4 popcorn kernels ("test" kernels) in heavy-bottomed 3-quart saucepan (I use the Farberware Classic Stainless Steel 3-Quart Covered Saucepan) along with the clarified butter and salt. Heat over medium to medium-high heat. 2 When the 4 kernels pop, add the rest of the popcorn kernels in an even layer. Cover, remove from heat, and count 30 seconds. 3 Return the pan to medium to medium-high heat. When it really starts popping, shake the pan gently back and forth over (or slightly above) the burner, holding the lid askew (at least from time to time) to let the soggy-making steam out. 4 As soon as the popping slows to several seconds between pops, dump it into a wide 4- or 5-quart bowl. If you like more butter on your popcorn, melt a tablespoon of it in the hot popcorn pan and drizzle it over the popcorn, tossing well to distribute the butter evenly. 1 Preheat oven to 250F/120C/Gas1/2. Line an 18x13x1-inch half-sheet pan with parchment paper. Measure popcorn kernels and clarified butter. Before starting to pop the corn, in 1-quart saucepan start melting together the sugar, butter and the tablespoon of water over low heat, stirring a few times. 2 Pop the corn as directed in Popcorn recipe, but don't use salt and don't add butter. Pour into a very large bowl (to give you room for tossing). 3 Increase heat to medium and cook caramel until it has been bubbling for one minute. Stir in the salt and 1/2 teaspoon of water; it will foam up. 4 Immediately drizzle the foamy sauce over the popcorn, tossing well to coat. Spread out on prepared half-sheet pan. Bake for one hour, stirring every 20 minutes. Remove from oven and let cool completely on the baking sheet. Disclosure: We are a participant in the Amazon Services LLC Associates Program, an affiliate advertising program designed to provide a means for us to earn fees by linking to Amazon .com and affiliated sites. We are a ThermoWorks affiliate, earning a small commission at no cost to you on purchases made through our links. This helps cover some of the costs of running the blog. Thank you for your support. Angie, I went many years without eating popcorn, too. I don't enjoy the flavor of air-popped popcorn, and corn popped in unhealthful oils don't make the cut with me. So I was happy to discover in 2017 that my extra virgin olive oil worked well, and now clarified butter! Sully, I urge you to try my less-sweet caramel corn. I think you would be pleasantly surprised at how much more satisfying the flavor is. 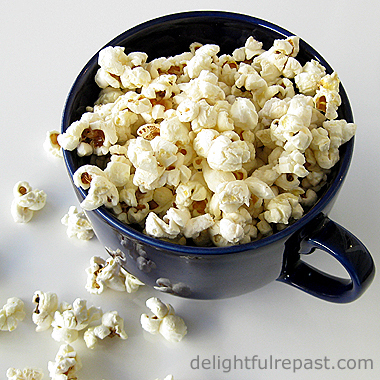 Popcorn is a favourite treat around here, and I've used olive oil for years. The clarified butter will be a good option to try out. Thank you, Zaa. I don't know why it took me so long to think of it! Hope you like it. Thanks, Lorrie. I hope you like it. I have occasionally found myself out of olive oil, but I always seem to have a ready supply of organic unsalted butter on hand. I'm not a massive popcorn fan, but if it was freshly made and natural like yours, Jean, I'm sure I could demolish a few cups mid-movie! Thanks, Pauline! :D We don't eat it often--organic and natural or not, it's not the most nutritious thing in the world, but it's pretty harmless. Popcorn is one of my favourite snacks. This is the first time I've heard of clarified butter. Margie, it has many uses. I hope you'll make some and try it out. You can serve little individual ramekins of it along with steamed artichokes. Or asparagus. 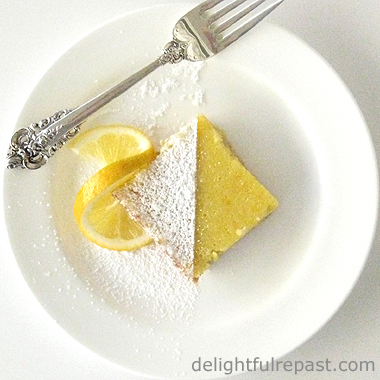 What a great idea of yours to use clarified butter, Jean! You always have done wonderful tips for us. I love popcorn, and don't fix it enough. Oh my! I love sweet and salty together! I may need to make some tonight for dinner—shhhh. The Sweetie is doing a Landscape job up in Nevada and I’m alone, he prefers his popcorn ‘pure.’ But he will LOVE the use of clarified butter—genius! Thanks my dear friend, you nailed it again! Kitty, thanks! I hope you'll try it soon. Thanks, Pegi. I hope you'll enjoy it as much as you expect to! I really like it a lot. Thank you, Menaka. AND it's organic. Thanks, Tony. Clarified butter is a must for things like artichokes and asparagus. You'll have to make some and tell me about your experience. Have only ever seen Olivia Colman in Broadchurch; she was very good. But I don't eat popcorn at the cinema, only homemade. Lea Ann, thanks so much. I don't see where microwave popcorn is much of a timesaver or anything, and when you make it yourself you can salt it and butter it exactly the way you like it. Thank you, Quinn. Good to hear from you. I really like the Eden Organic brand, which you could order from Amazon, but I often just buy the organic popcorn from the bulk bin at a local health food store. I was just planning out my little garden, and my husband mentioned growing some corn. But I pointed out that it needs, as you mentioned, a good bit of room! Oh this sounds just wonderful Jean, I will have to clarify some butter tomorrow afternoon so I can make your caramel corn tomorrow night. Less sweet is just the ticket, it sounds ideal. Thank you, Mary! I do hope you'll like it as much as we do. I don't like that thick, sugary layer on the caramel corn that you can buy. Thanks for sharing the experience of working with different oil for popping corn. The way you made clarified butter is how we make desi ghee. and use for many recipes. It gives off lovely flavor, right? Yes, Balvinder, a lovely flavor. I'm looking forward to using it in several Indian dishes. Wishing you a happy April. Thanks, Jan! Butter, clarified or regular, is my very favourite saturated fat! LOVE your method for popping! Maybe I can overcome my fears, too - thanks to you! Clarified butter and popcorn that's not too sweet sounds like an ideal combination to me. I went through a phase of using lots of clarified butter in just about every dish in the early 1980s after a very fine cook told me that it would be the answer to just about everything. Then I moved on to olive oil after a different very fine cook told me that it would be an even better answer. I still use clarified butter in curries but I'm grateful for the reminder that it's very useful for other things too. I do like popcorn dusted with a little smoked paprika and a hint of a few other spices alongside a pre-dinner drink now and then. Thanks, Phil. 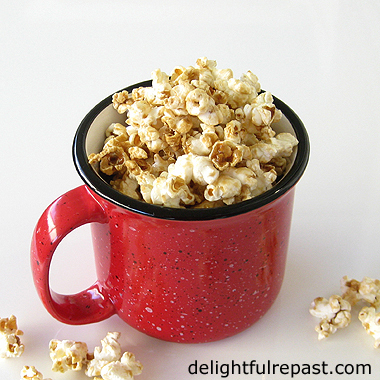 And that popcorn with a dusting of smoked paprika alongside a pre-dinner drink sounds good as well! I pretty much use butter, clarified butter and extra virgin olive oil for everything, though I'm thinking of adding avocado oil to my arsenal. I would never have thought about using clarified butter for popcorn, Jean. What an inspired idea! I'm using judicious amounts of butter in place of oil these days as it feels so much healthier in view of some of the things I've been hearing. I love the caramel option too - it's a treat, but a wholesome one! Thank you so much for your support of Hearth and Soul. April, thanks so much. I like that -- "judicious amounts"! I've been telling people for decades to ditch the margarine and bad oils, so it makes me happy to see that idea going mainstream now. Marilyn, thank you. My sister loved her popcorn popper and used it several times a week, but I've never had one because I have waaaay too many appliances as it is! :D I hope your week is going well, too. I really like popcorn, and often use olive oil. Haven't tried clarified butter -- neat idea. Need to do that. :-) Thanks! John, I think you'll like it--I mean, what's not to like about butter, right?! I love popcorn but have never tried it with evoo or the clarified butter and that sounds well worth a shot. 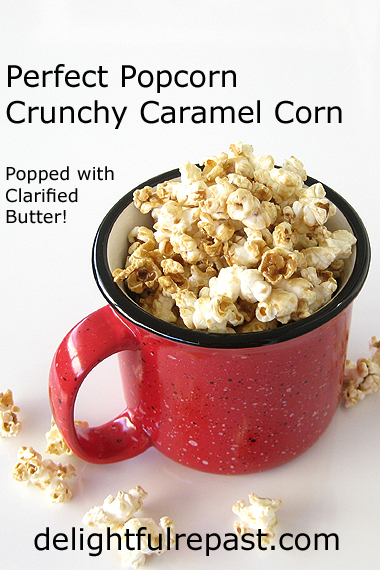 The caramel corn especially sounds delicious! Thanks for such good tips! Thanks, Jeanie. I hope you'll try it soon and try out the evoo and clarified butter and let me know how you liked it. Jean this is the refined version of my childhood favorite, Cracker Jack. I am pinning this to make at home. Thanks for the recipe. Thanks, Mary. I hope you like it. I definitely like it better than Cracker Jack, which I liked, except for the peanuts. Seems everyone either loved or hated, nothing in between, the peanuts! Oh yes! Now this is more like it! LOVE popcorn - this looks divine! Thank you for sharing this with #TriumphantTales. Do come back next week! Thanks, Jaki! I don't know anyone who doesn't like popcorn!